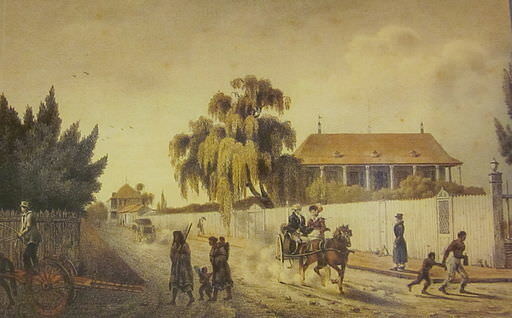 By 1821, the predominantly French character of New Orleans was changing. After Napoleon sold the Louisiana Territory to the United States in 1803, Anglo-American Protestants poured into what had been a French and Spanish Catholic city. This was a deliberate strategy on the part of President Thomas Jefferson to integrate Louisianans into the United States. The newcomers ranged from uncouth riverboat men known as Kaintucks, to businessmen and professionals from New England and the mid-Atlantic states. They regarded the Creoles as lazy, uneducated and lacking in business sense. Some French have come hither since the return of the Bourbons, but they did not find themselves at home; some joined General Lallemand in his settlement on the Trinity River, a few remained so as sensibly to increase the French population. The accession, if worth mentioning, did not exceed the emigration which has taken place of those who did not like the American Government, or had amassed fortunes and have returned to France or settled in the West Indian islands. Since the breaking of Lallemand’s colony, a few have returned to New Orleans, but so few that they are not a perceptible quantity, even in the comparatively small French community. I have written about several Bonapartists who were in New Orleans in 1821 and feature in Napoleon in America, including Louis Lauret, Félix Formento, Charles Lallemand and Jean Joseph Amable Humbert. One I have not yet mentioned is Lauret’s friend Honoré Fanchon. Little is known about him, except that he was a Napoleonic officer who was at the Champ d’Asile in Texas in 1818. He must have been in the United States in June 1820, as his name appeared on the list of colonists who were to receive the funds collected by the French newspaper La Minerve (colonists who had left the country were ineligible). The New Orleans City Directory of 1822 lists a Françoise Fanchon as a trader at 152 Burgundy Street. I thus decided to make Fanchon a New Orleans shopkeeper, and to give him a wife. Though we don’t meet her in the novel, her skirt can be seen through a doorway. 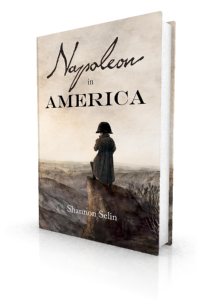 Her presence influences Fanchon’s decision about whether to join Napoleon on his new adventure. Vincent Nolte, Fifty Years in Both Hemispheres, or Reminiscences of the Life of a Former Merchant, translated from the German (New York, 1854), p. 240. Courrier de la Louisiane/Louisiana Courier, October 19, 1821, p. 3. Benjamin Henry Latrobe, The Journal of Latrobe (New York, 1905), pp. 169-174, 187. Courrier de la Louisiane/Louisiana Courier, May 16, 1821, p. 3; May 23, 1821, p. 3. Courrier de la Louisiane/Louisiana Courier, June 1, 1821, p. 3. My pleasure, Tom. Glad you enjoyed it. Kintucks floated rafts of lumber from Kentucky down the Mississippi river to New Orleans, then went home overland with the profits, coping with crooks and bandits of every description. They had to be tough to survive this gauntlet. Thanks for the details about the Kaintucks, John. They do sound like very hardy fellows. On grief felt for the death of Napoleon: I find in Henriette’s album a doggerel poem about it signed TS, and followed by a gibe at the “false history of a pensioned “Black Dwarf” of biography.” This was Walter Scott, who had written Napoleon’s life and also a novel “The Black Dwarf”. His deeds of glory live! To him we’ll honour give! Splendid stuff, and very in keeping with the mood of the time. Thanks, Geoffrey. Comments about lazy French settlers were also made by an American visitor to Cahokia, Illinois. He commented that the French would rather hunt than farm. In fact, hunting was their work while it was the American’s recreation. Interesting how that seems to have been a common, though inaccurate, perception in the early United States. Thanks, Jim. What is good and bad in the French manners and opinions must give way, and the American notions of right and wrong, of convenience and inconvenience, will take their place.